There is really no other rose in the world that comes close to this extraordinary colour blend. 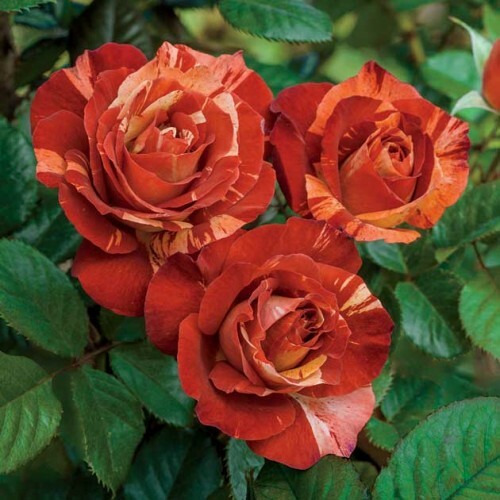 The 'tropical' part of this rose comes through in its sunset-like orange petals and the 'lightning' can be seen in the bright cream stripes. The special effect is accentuated by a layer of purple streaks that create the look of a stormy sky! If you are still in doubt that such colours exist, don’t wait to be struck by lightning to plant this amazing Climber. Each perfectly shaped bud and flower will hold its novel colour for days and the prolific, vigorous plant, which reaches mature size and full display in 3 years, will only slow down its flowering when it transitions into winter. If the extraordinary bloom colorrs were not enough, Tropical Lightning presents some of the glossiest leaves of all roses.